In our modern day birthstones have been given to represent each month of the year. For example, garnet and amethyst represent January and February respectively. As opposed to those born in March who are represented by the aquamarine and bloodstone. We thought it might be fun to create a series of birthstones in which we talk about gemstones and the months they represent. That starts today, we hope you’ll join us over the next few months as we complete a January-December guide! The historical origins of birthstones have been traced back to the breastplate of Aaron, upon which were twelve gemstones representing the proverbial Twelve Tribes of Israel. However, countless legends have circulated throughout the world about the various birthstones and their healing influences. It was often believed that wearing the gemstone during its corresponding month cycle maximized the effects; but, if one were to own all twelve and cycle through the months with the correct stones they would experience a heightened aura of healing. Regardless of any supernatural healing powers these beautiful gemstones have always been precious and sought after throughout history and into today. They make lovely and unique birthday presents and may become a nice identity piece among your jewelry collection. Most known for it’s deep red color and pomegranate resemblance, the garnet stands as one of the most durable gemstones. This beautiful gemstone is found all over the world, including Greece, Czech Republic, Russia, Wyoming, Tanzania, Madagascar, Sri Lanka and India. The garnet is a symbol of lasting friendship, peace, prosperity and good health. Some have even called it the “Gem of Faith”. Amethyst, a beautiful blend of violet and red quartz, is the second most abundant material found in the Earth. The word amethyst is derived from the Greek word “methustos” meaning “intoxicated” and was believed to provide protection from drunkenness. While it’s vibrant purple color is what the stone is most known for, the gem is found in pink, blue and red shades depending on the light. 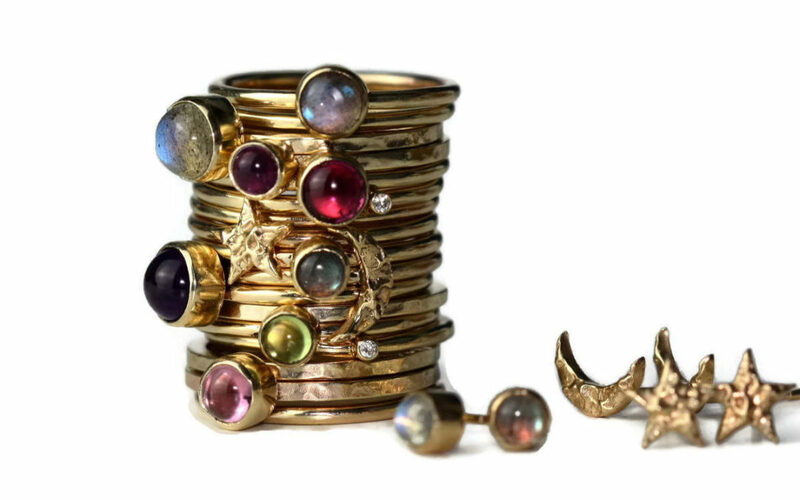 Those born in March are lucky enough to have two birthstones associated with the month. While both stones are different in appearance, they share the symbolism of boosting the health of whoever wears the gem. The aquamarine promotes tranquility like that of the sea. It is recognized for it’s light green and blue color tones. The larger the stone, the more intense the color. On the other end, the bloodstone is a dark green stone sprinkled with red spots and comes in many shapes and cuts. Though the bloodstone may not hold the elegant beauty of the aquamarine, it is prized for its symbolism and promotion of health and prosperity. We hope you’ll join us in the next few months as we discuss April through December and their corresponding gemstones. We’re big fans of jewelry around here (obviously) and would love to help you create the perfect gift for that special someone.